Authentic: genuine, sincere; accurate in representation of the facts; truthful; trustworthy in intentions and commitments; not a copy or forgery. From the Greek authentes, one who acts independently, from auto (acting from within), and hentes (a doer). Socrates famously wrote: “Speak, that I may see you.” The ancient Greeks believed that a person was created ‘per sona’, through sound and vibration. Through our voices, others instantly create a mental image of who we are, what we are feeling, and even what we stand for. Our vocal ‘signature’ – like our personality – is as unique as our fingerprint or DNA. Work on voice as a physical instrument must happen in parallel with understanding voice as an expression of self. We also need to relate the learning to specific situations in our own work and life. Voicework is not about inventing a voice, but about discovering a sound and way of communicating that is an authentic expression of us, us at our best. An authentic voice communicates clearly, compellingly and respectfully what is most important. It is compassionate, honest and exciting. An authentic voice has passion, and leads with quiet strength. It is a voice that others trust, because it is trust-worthy. Right now, there are customers, employees, colleagues, communities, voters (and … and …) looking for voices they can genuinely trust. Something has been going wrong for a long time. And the individuals and groups that will win that trust will be those who offer a genuine, authentic voice that rises above spin and broken promises. Einstein famously said that problems cannot be solved at the same level of thinking that created them. To create a paradgim shift towards authenticity, we need first to change our minds. Here are 4 Principles to inform thinking around voice and authenticity. It reconnects us with meaning, positive human qualities, and what matters, releases creative energy and engages commitment. It builds trust and raises the quality of relationships. By getting people talking about the real issues, it saves energy and resources – ours and other people’s – and addresses the real need. What we do and say – or don’t do or say – has impact. It is a cause that has an effect. We have power and choice about how we use our voice. We have responsibility for how we use our voice. On hearing our voice, others hear our character, history, mood and intention. The same beliefs, thought processes and emotional patterns that define our character also shape our voice. Changing our voice is therefore about changing attitude and behaviour. Just as voice echoes the self, vocal goals often echo ‘life’ goals. An authentic voice always contributes something that no other voice could, and can therefore lead in any situation. An authentic voice challenges and inspires others to find their own authentic voice. Authentic voices never compete with each other. If we want to change our voice – individually or at the level of the organisation – then we must be prepared to learn new techniques and change our behaviour. In order for these changes to feel part of us and be sustainable, we must take a journey inwards to find the essence of what we want to express. And then we must learn how to express it. Here 8 Practices that I believe help us develop greater authenticity; each of these links to a quality. 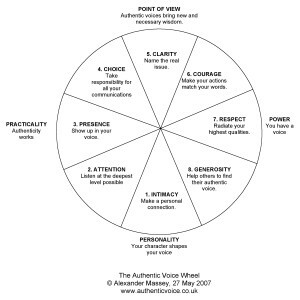 I have summarised the 4 Principles and 8 Practices (and their 8 Qualities) on what I have called the Authentic Voice Compass (click on image below). Learn to connect with what is most personal to yourself and others. Go beyond just transmitting information, and offer inspiration as well, connecting with others at heart level: share from your heart to the hearts of others. Communicate your personal connection with your subject. Demonstrate your understanding of your listener’s / readers’ personal connection to the subject. Speak to real, human concerns. Learn how to develop and sustain awareness of what is and is not being said. Increase the number of ways you can listen to yourself and others with openness and acceptance. Give serious attention to use of language, seemingly unimportant slips of the tongue, non-verbal communication. Remember the adage, “Everything is communication.” Give respect to all voices, regardless of their origin or message – listen for the need, the wisdom, and the unique contribution to be found in every voice. What needs to be said could come from anyone. Stand up and be counted. Speak for yourself. Bring your real self into your communications. Share what is true for you, in your own words and your own way. Support and validate your feelings, needs and ideas. Take responsibility for getting your needs and wisdom heard. Follow the dictates of your authentic knowing (including ‘crazy wisdom’); learn how to tap your inner wisdom, to distinguish this from your ‘chattering’ mind, and to master the courage to voice it, even if it threatens the status quo, your reputation or position, cultural norms, or received wisdom. Learn to align content, timing and context – communicating what is true, at the right time, in the best way. Remember the adage, “Communication is the response you get”. Communication is relational, and depends for its success on your being able to speak your own and the other’s language simultaneously. Your words, tone of voice, intent, timing, and way of relating to the situation are all your own choice – and all have impact. You influence situations by what, how and when you communicate. Learn how to name what is really going on, so that everyone can talk with each other about what is most important. Distinguish what is real, and what is fantasy or insincerity. Generate positive movement in the most stuck situations by creating opportunities for the conversation that everyone needs but has been failing to have. Naming something clearly and accurately is a powerful act. Name your real feelings and deepest human needs, and acknowledge those of others; name what is relevant that nobody has yet had the clarity or courage to voice. Learn to make your voice trustworthy. Always say what you mean, and mean what you say. Demonstrate the trustworthiness of your communications by echoing your words in deeds. Deliver on your promises. Be quick to repair broken agreements. Learn to use words and other means of communication to serve the highest possible goals, and purposes beyond profit or personal gain. Consider how you can use your own communi-cations to promote communi-ty and positive relationships. Offer deep respect to all those you speak to and about. Speak true, speak fair; offer compassion and inspiration. Learn how to help others access and give voice to their realness and uniqueness. Create opportunities and the conditions where others feel inspired, empowered and safe to show up in their own voices. Show the way by using your own authentic voice. Give respect to all those who do not demonstrate an authentic voice – an authentic voice does not need to silence or diminish other voices.